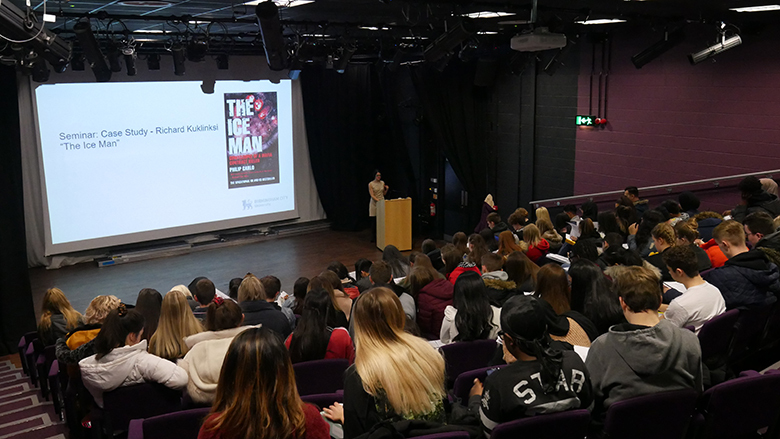 Criminology students at The Sixth Form College, Solihull benefitted from one of a series of lectures from Birmingham City University this week. Professor Liz Yardley, a Criminology lecture from BCU, visited the College for the second time this academic year. Following a presentation about hate crime before Christmas, Professor Yardley returned to give a lecture entitled ‘What makes a murderer’. Her presentation linked directly to the students’ Criminological theories unit, which was an extension of the biological, psychological and sociological reasons why someone commits murder. She used case studies concerning Adam Lanza, the young man responsible for the Sandy Hook School shooting in America, and Richard Kuklinksi, a former Mafia hitman. As well as Criminology, the College offers Social Science A levels in Economics, Politics and Sociology. Further information about these courses is available on the College website at www.solihullsfc.ac.uk. Prospective students wanting to learn more are encouraged to sign up for a Spring Talk & Tour on Thursday 28 February or Tuesday 5 March. Pre-registration for these events (which both take place between 5.00 – 7.00pm) is available at www.solihullsfc.ac.uk/spring-tours.